Medicare Part C (Medicare Advantage Plan) is the combination of Medicare Part A and B. Here's a look at the Part C basics. Medicare Part C is also known as Medicare Advantage. It combines both Part A and Part B and provides at least the amount of coverage as those plans, but often provides additional benefits at a lower cost. Medicare Part C coverage is provided by private insurance companies who are funded and approved by Medicare. 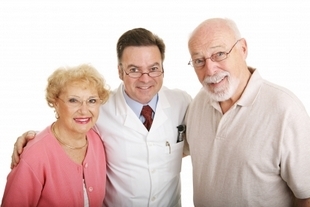 Medicare Advantage Plans include four different types of plans. PPO plans have a network of doctors and hospitals that you can choose from, but you are also allowed to visit providers outside the network at a higher cost. You do not have to choose a primary care physician and you have the ability to choose any doctor, even specialists, without a referral. Some plans cover prescription drugs. HMO plans also have a network of doctors, however, you can only visit doctors within the network and you must choose a primary care physician. You must have a referral from your primary care physician to see a specialist. If you choose to receive medical services outside the network, you’ll be responsible for paying the full cost. Some plans cover prescription drugs. PFFS plans allow you to choose any doctor or hospital that’s been Medicare-approved as long as they agree to treat you and accept the plan’s payment terms. You do not have to choose a primary care physician or have a doctor’s referral to see a specialist. The plan has pre-determined rates for doctors and hospitals and the amount you have to pay for services. Some plans cover prescription drugs. MSA plans have two parts. There is a high deductible health plan and a savings account. Each year, Medicare funds the savings account with an amount to cover your coverage. However, the amount is less than your deductible which requires you to pay some out-of-pocket before the plan begins to pay for Medicare-covered services. You do not have to choose a primary care physician. Though you have the flexibility to receive health care from any doctor or hospital, your plan may have preferred providers that will provide services at a lower cost. You will have to purchase prescription drug coverage (Part D) separately. You will be responsible for paying the premium for Part B which ranges from $96.40 to $308.30 depending on your income. Depending on the plan you choose, you may not pay an extra premium. Your plan will have set deductibles and copayments that may be different from those of Part A and Part B deductibles and copayments. Though a Part C plan may provide benefits that Part A and Part B coverage don’t provide, you may have less flexibility in choosing a physician, especially if you enroll in an HMO plan. Depending on where you live, there may not be any Medicare Advantage Plans available. Or, if there are plans available today, they may decide to cancel at anytime depending on profitability. Your current physician may not be part of the available plans’ network, leaving you to pay the full prices for services. When Can I Join Medicare Advantage Plan? Your initial enrollment period when you first become eligible for Medicare. This period starts 3 months before you turn 65 and ends 3 months after you turn 65. If you are under 65 and receive Medicare coverage eligibility due to a disability, you can join Part C from 3 months before to 3 months after your 25th months of disability. Between November 15 and December 31 each year. Coverage will begin on January 1 of the next year. Between January 1 and March 31 each year. You can only join or switch to a plan with prescription coverage during this time if you already have coverage (Part D).